Imphal Talkies released "When The Home Is Burning"
Imphal Talkies have released their much awaited album "When the home is burning" on 27th Nov 2014. 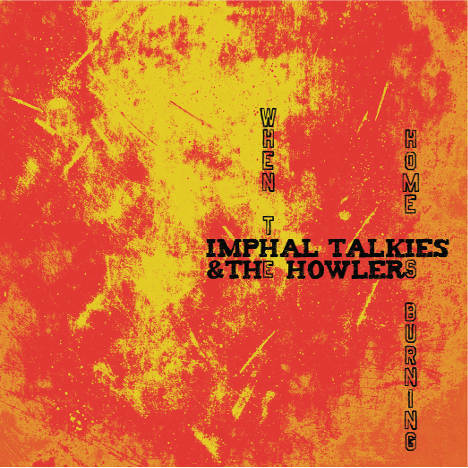 Imphal Talkies is a folk rock band from Manipur, formed in 2008 by Akhu Chingangbam with Sachin Angom. The band released its debut album Tiddim Road in 2009. The band has performed in and around Delhi at various protest events and have been campaigning through their music to repeal the draconian act AFSPA, 1958, from the NorthEast region of India and Kashmir. The band was chosen as one of the 33 bands from 33 countries for the music album compilation entitled "Album of the Revolution" released in UK by Un-convention and In Place of War. The just released album "When the home is burning" is a journey into the past. It is a collection of old songs from concerts that Imphal Talkies and the Howlers used to perform in the streets of New Delhi over the last six or seven years. Songs like "India, I See Blood in Your Hands" and "When the Home Is Burning", written way back in 2007 and 2008, had their own place in the streets. Now the time is ripe and the songs have finally found their place in the album. "Ei Seeragey", was originally inspired by poet Thangjam Ibopishak's "Charamnaraba Keithel Huifrom" his first poetry book Apaiba Thawai published in 1969. Most of the songs are political and this is an area in which Imphal Talkies and the Howlers excels. The album as a whole can be read as a sense of resistance against injustice across this country in general and Manipur, where the band is currently based, in particular. In March 2013, a couple of band members were thrashed by the Manipur Police who were on duty during the visit of the honourable President Pranab Mukherjee in Imphal. This incident led the members to write the song "Mr President Is Coming". The album can be bought online from the link below. And dear friends, the 150 bucks you spend in buying this album will show the guys behind the music your love and appreciation for their effort. What is India doing to Sharmila? This article was posted on November 30, 2014 and updated with lyrics on December 1 2014.